Call 818-233-0262 for special holiday discounts! 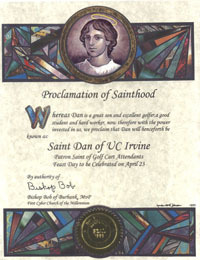 The Proclamation of Sainthood certificate is a high-quality reproduction of an original, signed design which proclaims the new Cyber Saint's status. 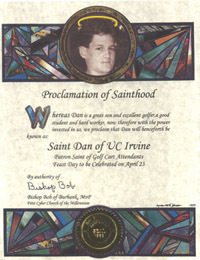 The certificate can be optionally personalized with the Cyber Saint's picture! The certificate is a great gift or an award of recognition to someone special. A congratulatory letter from the First Cyber Church of the Millennium will be mailed with the certificate. The Cyber Shrine is just like a shrine you would find in an old church or temple, except it exists only in a private alcove in the the First Cyber Church of the Millennium's "virtual cathedral". Only the Cyber Saint will have the keys (the URL address of the shrine) to this private alcove - sent in a congratulatory e-mail. 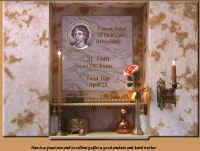 The shrine can be viewed for one full year, and then can be renewed on the Cyber Saint's feast day! You can view a real, on-line shrine by going to the First Cyber Church of the Millennium's Cathedral Entry Door and then entering the code for a Cyber Saint's shrine: DA 1288. Let us know what you think! 3. Cyber Sainthood Super Saver! Add a Cyber Shrine for only $5! 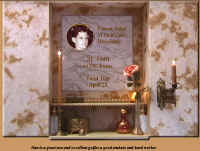 For only $5.00 additional, you can add a Cyber Shrine to any type of Certificate order. 4. A Cyber Saint's Calling Card! Provide your new Cyber Saint 20 with standard-size business cards, suitable for every occasion, for only $5.00 additional, with any other item ordered. 5. Your Cyber Saint's Photo Option! You may optionally send us a photo of (color or B&W). 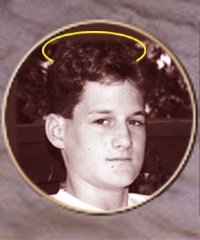 The saint's photo will be hand retouched to reflect "Cyber Sainthood" (i.e., a halo!) and then printed on the certificate or featured in the shrine. The First Cyber Church of the Millennium Icon Artist has created a "universal" Saint Cyber who will be shown on basic shrines and certificates. 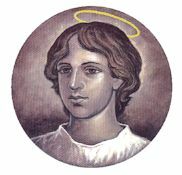 The Cyber Saint�s name - for example, "St. Nikki of Van Nuys"
An optional honor to be a "patron saint" - such as "The Patron Saint of Skateboarders"! You supply the reasons for sainthood - see the samples for ideas! If this is a gift, you can also send your greeting. The FCCM will include in this in a congratulatory letter or e-mail to the new Cyber Saint. As an added bonus, the the First Cyber Church of the Millennium will send each Cyber Saint a congratulatory card on his or her next feast day! Yes, we'll have T-shirts, coffee cups, and other interesting products - all to honor our Cyber Saints!